It has its moments and quite a catchy chorus heads that list, but I was hoping for something more interesting. It's giving me strong flashbacks to a lesser single of a band I really like that I would never have expected to compare them to. It'll probably grow on me but I like it much less than their last set of singles. Given the competition though, I hope it hits #1. Auch wenn man am Anfang aufgrund des Titels vermutet, dass es sich um einen typischen Boyband-Schmusesong handelt stellt man jedoch nach dem Hören fest, das es eigentlich ein Rocksong ist. Ich glaube sie wollen mit diesem Lied alle überzeugen die denken das sie eine Boyband sind und billige Popmusik machen. Dennoch gelungenes Lied! Has that Pop-punk?/Pop-rock?/rock feel to it and honestly, I'm kinda confused at which artist they're trying to be in this song. Feels a bit immature and kinda shakey at times. Decent attempt of a late '90s / early '00s punk rock revival. Better than any of 5SOS' other material. Not bad, one of their better ones but they have 1 or 2 better. ▒ Swingend poprock plaatje uit juli 2015 van de Australische rockformatie uit Sydney: "5 Seconds Of Summer", alias: "5SOS" !!! De band bestaat uit: "Luke Hemmings" (lead zanger, gitaar), "Calum Hood" (bass gitaar, zang), "Michael Clifford" (gitaar, zang) en "Ashton Irwin" (drums, zang) !!! Voorloper van hun nieuwe album ☺!!! Misschien moet ik me ervoor gaan schamen, maar ik geef toe dat ik een soort van zwak heb voor 5SOS, vooral door hun niet te filmen zo catchy tienerpoprock. Ik moet wel zeggen dat ik 'She's Kinda Hot' een klein beetje eentonig vond toen ik hem voor het eerst hoorde, maar sindsdien ben ik het steeds meer gaan waarderen. Met de eentonigheid valt het wel mee en de gitaarsolo is heerlijk. Ik heb al lang geen 6*-waardering gegeven op deze site, dus dan wordt het weer eens tijd om de volle bak te geven! Das mag gut gemeint sein, aber irgendwie tönt es trotzdem furchtbar...?!? Ondanks dat ik niet tot de doelgroep behoor en ook niet warm loop voor dit genre heeft dit zeker ergens wel iets. Krappe voldoende. One of those songs that hits me as being so bad that I have to go on a website and give it a poor rating while saying that I hate it. I apologise if I am unintentionally and unknowingly repeating something that has already been said. Also the song portion of the review starts 6 paragraphs down, if that's all you want to see.<br><br>The '90s boyband model really makes no sense in the present environment. Really in hindsight, it's bizarre that it even was a concept to begin with. It amazes me to think how much went into getting adults to convince teenagers that they really want to know all of these 5 or so guys names and their favourite foods and everything.<br><br>But in a digital age, the image doesn't work the same way. Because now everyone's on social media and in order to stay in people's minds, you need to be there everyday. And the key to that is that you need to be more relatable; the idea of a pop star being a 'larger than life' monolith is just about dead. And imagine if the peak of *NSYNC's fame happened in the Twitter age: What would a nearly 30 year old Chris Kirkpatrick come up with that doesn't seem like a forced attempt at keeping in touch?<br><br>So the boyband model of today makes a lot more sense. Guys that are potentially still teenagers, and along with that, still feel like regular kids growing up the same way their fans are.<br><br>Of course, you can debate whether or not 5 Seconds Of Summer really count as a boyband. Sonically there's a clear difference, but marketing & image-wise, they pretty much fit the bill. If I can appreciate them for one thing, it's that they clearly know how to connect with their audience, and write songs with their own distinct character.<br><br>In fact it's probably most logical to compare them to Blink-182 at this stage. I remember seeing the video to "All The Small Things" as a kid, and though I identified them as a rock band, the parodical elements of the video slipped past me. But given their popularity then and now, it's hard to say that at that point they weren't in some way pulling a similar demographic to what 5 Seconds Of Summer do now. 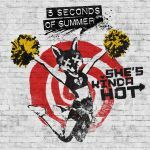 I've no idea what the future holds, but it's fair to say that in a similar way, 5 Seconds Of Summer are going to endure in the minds of their fans now.<br><br>"She's Kinda Hot" pulls these boyband & pop punk elements to their full effect. I was a bit concerned seeing the title of the song because it drew to mind all those awful posts some of my friends are always sharing that boil down to 'DAE women are objects?!' For my fortunes, they smartly drop that angle after the first verse and never revisit it.<br><br>But at the same time, I can't totally blame them for doing it. Pop punk is ALL about sneering, obnoxious teenagers that want nothing more than to irritate their elders. If I'm being offended by it, they're doing their job!<br><br>After that, the rest of the song feels like a codifier for boyband ideals. Granted there's still the punk element of ignoring fair advice, and of course the live fast, die young attitude it seems to embody. You can tell they're in on it and it's a bit amusing. The main thing I've always got from it though is how inclusive it is. When they say 'we', it feels like they're talking about their fans as well. It's not just their moment but it's yours as well, how cool is that?<br><br>I personally don't enjoy the song. The interjections get more cringy upon each successive listen. It also still sounds a bit flat musically, with that guitar solo in particular being too muddy to get anything out of. I can see them improving on this in the future but they're not there yet.<br><br>But I give it a bonus star because I can get what they're doing. And I mean, there are surely older music fans who see Green Day as filling the same role 20 years ago as 5 Seconds Of Summer fill now in my eyes. Why repeat the cycle? Zo een beetje zagerig toch maar hoor dacht ik zo. Not good at all. It's actually quite difficult to listen to. Sorry aber die hasse ich! Alles von denen was ich kenne nervt mich nur noch! Reicht vielleicht für den Schulhof aber das war´s dann auch! I agree with the Blink 182 comparison. The softer parts of the song have a Sugar Ray vibe too. I'll also throw in The Offspring. The bridge actually pulls out a few riffs. There's just something uneasy overall about it. I think it is the lack of cohesion in some moments. Can't give this less than 3*. I enjoy this (surprise, a 5SOS song I actually like) but it never seems to break into something great. Shame it didn't have longevity.<br>I'm getting My Chemical Romance 'Teenagers' vibes from this, along with a bit of Good Charlotte (well the Madden twins did co-write this). Ok but done so much better by other groups.<br><br>10 weeks in the UK top 100.<br><br>UK#14.<br>Ireland#6.<br><br>Taiwan#3.<br><br>Brazil#17.<br><br>1 week top 10. World Chart#10.<br><br>200,000 copies sold in the UK. Mehr oder weniger ok, aber ich bin eindeutig nicht die Zielgruppe. @southpaw: Da bin ich ganz bei Dir. Das lässt mich doch etwas kalt.